Well my SAGA chapter's annual auction was yesterday. It was a great time, we raised a lot of money, had some great food, laughed and caught up with old friends while meeting some new ones. One of the things our auction had to offer was this sweet receiving blanket made by one of our members. I just love it. The top photo shows three of the four corners at once. I wasn't clever enough to figure out how to take a photo of all four at one time. Maybe another day. Each of the four corners follow below. Don't you wonder what this wee bear is thinking as he whiles away the afternoon watching the honeybees? Oh and here he has followed the honeybee to the daisy patch. Careful wee bear, better not get too close! 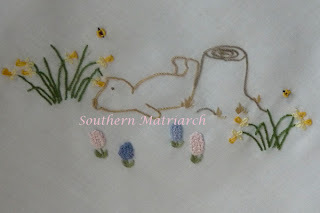 He is a young wee bear and needed to rest again when he found this field of forget-me-knots. Taking in all he sees. "Where did all the honeybees go?" he ponders. 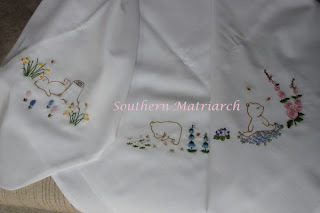 This precious cotton receiving blanket may not ever be used, it just makes my heart sing, and that is enough for me. 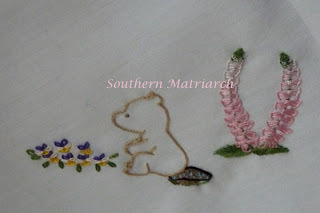 The member that stitched it is so lovely and does such beautiful work. She didn't think it was all that much, but I just love it. The sweet simplicity of it just makes me sigh. And speaking of the auction dear readers, those who graciously bought raffle tickets for the beautiful doll dress quilt, sadly you did not win. Neither did I. The mom of one of member's quilted the quilt and dog gone it, if she didn't win it as well! Not sure what voodoo spell she was casting as she stitched, but it worked. If you met her though you would be glad. She gets so tickled and was as pleased as punch when she took that quilt home. Thank you to so many who bought raffle tickets. Our chapter will use the proceeds to bring in teachers and advance our Wee Care project. Bless you. What you are stitching on? I see why you love that blanket, Martha. It is perfectly sweet and well done too. Did you win the blanket? Is this her own design? Thanks for sharing. Your little treasured blankie is adorable, Martha & I can easily understand why you fell in love with it. I'm sorry neither of us won the quilt but I'm happy to hear it went to someone who put her own work & talents into it. Karma! 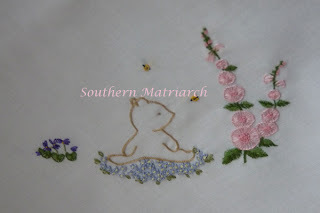 I can get in that little bear's head because the embroidery is so expressive! Lori, I did bring the blanket home with me. Had a kid call yesterday and lay claim to it. :) I have no idea where Geri got the design. I may have to ask her. Retta, it just makes my heart sing I tell you. It reminds me of a sweet children's book. Julia, I think that is what drew me to it. The simplicity just seems to talk right out loud. I love it... and may have to copy it for my own hopechest. Bodie is too big for that. Good for you to take it home. 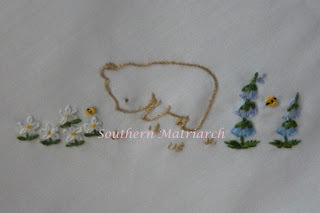 Oh Martha, the embroidery is wonderful. So precious and sweet. I LOVE it. Thanks Robin and Goosegirl. I like things that make me smile and this one does it. I was looking through my old Inspirations magazines and came upon this very blanket. The issue is 44. Thanks for sharing; I'd forgotten how sweet this was.